Perhaps the cold winter weather has you longing for those warmer days when you’re not trapped indoors for cooking, gathering, and entertaining. Warm weather means more time outdoors, and one addition to your landscape that can facilitate the enjoyment as well as the versatility you can find in your yard is an outdoor kitchen. As this VIDEO shows, an outdoor cooking area isn’t a good project for DIY’ers. As water, gas, and electricity are involved, it’s something left to professional contractors. And the most important element – the design. Remember, once you get those water and gas lines down, as well as electrical conduit, it will be difficult and expensive to reposition them. You want to make sure you’ve got everything thought through in advance; that’s where a landscape designer experienced in outdoor kitchens comes in. Good planning doesn’t just help with the placement of the utilities; you want the overall feel of the area to be an extension of the home, not an afterthought. Good outdoor kitchen designs provide a flow from the house to the outdoors, making it in effect an outdoor room more than a yard feature. Outdoor kitchens can be simple structures, involving merely a firepit and a counter, or they can be more elaborate, with full water, gas, and electrical service. 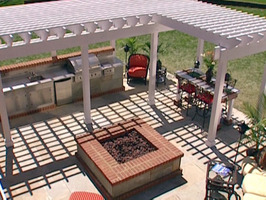 Check out this basic run-down of the options and considerations in planning an outdoor kitchen. Architectural Landscape Design specializes in bringing your outdoor cooking and entertaining visions to life with firepits and fireplaces, pergolas, and full or partial outdoor kitchens.